There’s a great joy in cooking for the people we love. But there is a greater fear in feeding family members a meal that can make them sick. Are we afraid of this possibility too? It’s just right to be very cautious about serving safe food. And it’s even more reasonable to be extra cautious in the kitchen in terms of kitchen hygiene. 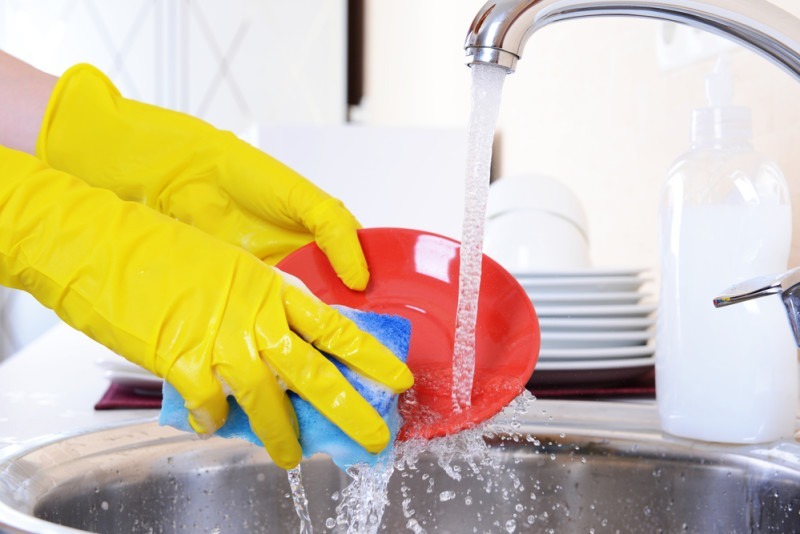 Advise your maid not to simply let the sponge soak around the sink in another pool of germs. Microorganisms love to multiply in wet cold areas such as sponges. – We suggest getting a plastic holder that can be attached to the wall just above the sink for the maid to hang the sponge dry. – Bacteria easily builds up and multiplies in sponges. Our maids must not use the same sponge after 30 uses to maintain cleanliness. Let her include this in her schedule! The puppy may look adorable as it wiggles its tail and makes its entry to the kitchen, waiting for any food crumbs to fall down. But we are not aware of the bacteria and germs they garnered in their furs while they roll and play outside. Furs can fly and can make its way to the food the maid prepared for our dinner. – Instruct your maid to let the pet play outside while the food is being cooked in the kitchen. – We also suggest installing a pet gate to prevent our pet’s entry! It’s usually more effective and easy to install. – Cats are very sly and can climb up on kitchen counters. Ensure the safety by always closing the kitchen door. Plates and utensils may look clean but our maids may miss a spot while cleaning them. – Remind the maid to rinse the utensils and wipe them with a clean microfiber cloth before setting them up for dinner. It’s better to be safe than sorry! This is the most common mistakes our maids can commit. We often leave the dishrags lying on the countertops after using them so we can easily find them again. However, it can still contaminate the ingredients and clean utensils if we leave them lying around. – Dishrags when not used can be stored or hanged dry in one place, away from food and kitchen counters. Germs move. The fridge is already one of the dirtiest part of the house by itself so we cannot admit another hot pot of food and risk cross contamination of food. – We suggest storing the cooked food properly by putting it in a container. Consider hiring a maid to maintain a tidy household environment. Eden Grace Maids offers manpower help that can carry out your family’s daily organizing and household chores routines. You wouldn’t have to worry about your household chores when you have someone trained and taught to take care of your household burdens!